Thailand has for several years been one of the top choices in the world for destination weddings. Couples from Europe and Australia in particular, not to mention their families and friends, have been drawn to the Kingdom's tropical islands and swathes of sandy beach as dream locations for their special day. Though western couples still account for a large percentage of the weddings that take place on islands like Phuket and Koh Samui; in recent years the country has fast become a prime wedding location for couples from countries such as India, Singapore and China. Just like those from the West, couples from countries in the Asia region also now look to exchange their vows in idyllic tropical surroundings, and thanks to the type of marriage celebrations traditionally held in these countries, they often arrive with large numbers of family members invited guests in tow. India in particular has become a key market for Thailand's fast expanding wedding business, with wealthy families and their guests from cities like New Delhi and Mumbai now more than happy to fly four or five hours to hold their lavish ceremonies and wedding parties by the beach. 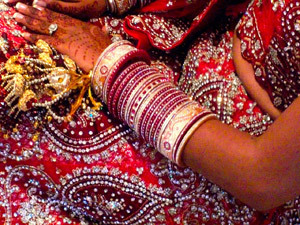 In terms of size, according to published figures provided by the Tourism Authority of Thailand, larger Indian weddings can see families spend more than B10 million (about USD340,000), and often involve a guest list of 300 or more guests. The celebrations also last longer than most western wedding parties, often three to five nights with traditional ceremonies conducted, Indian food and entertainment also provided, plus the added appeal of Thai hospitality and design touches. Despite such extravagant trends, many couples from around the world still choose Thailand as a wedding destination because of the many options now available for a truly personalised marriage. Private villas are a particularly popular choice as a wedding venue, with private chefs and customised catering options also high on the dream wedding wish list. The variety of locations now available means couples can choose either beach or cliffside properties, with a background of blue skies or lush jungle. Although the former remains the most popular choice, some newlyweds prefer the privacy offered by a more remote setting and mountainside locations also offer a wider variety of photographic opportunities. With demand so high, the smart villa owners in Thailand have either built or adapted their rental properties to better suit wedding parties. Wide lawned beachfront gardens are now common features and ideal for the ceremony itself, while expansive covered terraces and generous indoor dining areas mean parties of 100 or more guests can easily be catered for in some of the larger villas on the Thai islands. This willingness to adapt and personalise the wedding experience to suit the happy couple's needs, no matter their culture or nationality, is what gives Thailand the edge over many of its global competitors. And despite the significant costs involved in holding a large private wedding (the father of a bride from India reportedly spent USD500,000 on a Phuket wedding last year), it is still up to 30% cheaper overall than many other tropical destinations. Then, of course, there's the honeymoon. It seems South Korean and Japanese couples can't get enough of Thailand's beach resort areas. According to the Bangkok Post, travellers from South Korea are expected to generate B50 billion in revenue for Thailand this year, an increase of 20% on 2012, while figures from the Thailand-Japan Tourism Promotion Association show the number of Japanese visitors to Thailand has increased by the same percentage since April last year. Whatever their home country, it seems couples looking for an Elysian location in which to exchange their vows continue to choose Thailand for its beaches, food, hospitality and flexibility.